Has technology enhanced or damaged our experiences? 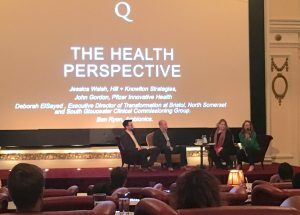 Experts across a variety of fields shared their perspectives during the One Question Conference at the Electric Cinema on 7 June. The conference asked experts to answer its central question from their own professional lens. The spirit of intellectual curiosity and the calibre of different perspectives gathered are exactly why H+K was proud to sponsor this year’s edition. It was a powerful day for conversation and no two perspectives were the same. A common theme? Responsibility and humanity must be front and centre within innovation. Can technology help keep healthcare human? Jessica Walsh, H+K London’s Managing Director of Healthcare, opened her session with a simple truth: “The conversation on technology is loud, but human need is louder.” She was joined in conversation onstage by John Gordon of Pfizer Innovative Health; Deborah El-Sayed, Executive Director of Transformation at Bristol, North Somerset and South Gloucester Clinical Commissioning Group; and Ben Ryan, CEO of Ambionics. Ben talked about the frustration he felt when health professionals couldn’t offer help with prosthetic false arms for his new-born son until he reached age one. It drove him to find his own solution in 3D printing, and that was the start of Ambionics, a startup providing unique prosthetic solutions for infants. Ben shared his thinking that “if you have an idea that could help someone, you have a moral obligation to pursue it.” With technological advances in mind, he underlined the need for UK prosthetists to learn 3D printing, which can be difficult to do when they are already busy with their jobs but is the source of the next great wave of advancement in their industry. John also shared a personal experience involving technology and healthcare. When he found out he had a heart condition, he turned to the internet for answers and additional research, as many people do. He noted the patient communities where people can connect and answer questions. “Technology gives us insight into how to manage our conditions.” The panellists agreed that accessibility and regulation are two key considerations for tech in healthcare, but more importantly that people must come first. “Nothing goes out the door without being co-created with patients and healthcare professionals,” said John. When discussing the risks of tech in healthcare, Deborah mentioned healthcare devices online could lead to a false diagnosis for patients. We still need clinicians to read and analyse the results. People are educated, technology is not. Several of the sessions at One Question focused on how data is used. “Big data is the source of some problems, but it absolutely can be the solution as well,” said Amelia Showalter of Pantheon Analytics. Amelia shared examples of how organisations use data to encourage people to vote or to make political operations more efficient. She also discussed how the recently announced Facebook dating app will know more about you than your standard dating platforms. Facebook knows your likes, the articles you’re reading, the places you’ve travelled, your relationship status… it’s miles ahead of anything else that’s ever existed. From another perspective, artist Em Cole shared a story of her online data being stolen and misused. When Em searched her name on the internet at age 17, she discovered websites where her photos were part of what she described as “image-based sexual assault.” To answer the question about technology’s impact on our experiences, Em said it all depends on how we choose to use technology and who we allow to be heard. When it comes to marketing, a panel of experts said it’s important to understand the level of interaction that consumers want to have, and then to ensure communication is authentic and trustworthy. Russell Parsons, Editor of Marketing Week, led the marketing conversation with Sophie Wooler of iProspect; Jeremy Waite of IBM Watson (a previous Creativity+ speaker); and Katie Baker of Samsung. The panel discussed whether data personalisation for marketing is “creepy or helpful.” On the plus side, consumers are seeing more content that is relevant for them. The experts agreed that “enhancing” experiences can mean different things for different people. During the One Question Conference, speakers also discussed how technology has impacted mental health, intimacy, and our financial wellbeing. Tara Prabhaker of Kantar Insights said, “Technology offers a way to step outside our bubbles.” After watching a VR video of a Syrian refugee camp, Tara knew that the technology was not created to escape reality but to experience it. Technology matched with empathy can lead to transformative experiences. To close the event, fashion and portrait photographer Rankin had a fireside chat with the event organiser, Sarah Parsonage. The pair discussed how brands are using influencers now, and people with minimal training “think they are photographers.” Photography has been democratised. Rankin also expressed concern for younger generations and their fondness for selfies. He noted that artwork he used to create in photoshop 20 years ago can now be done in the touch of a button in Snapchat. Storytelling is changing – it used to be about the past, today it’s about the “now” where it’s difficult to provide the same level of depth. While tech has dramatically changed our world, the One Question conference was a reminder that human need and empathy still have a vital influence on innovation.